Miniature paintings from the estate of Mrs. Adrienne Minassian. The paintings often include text from Persian and Indian tales. Many of the illustrations within the Minassian Collection are depictions of stories from the classical Persian text, Shahnama of Ferdowsi. The project originated in the work of Brown University student, Allana Benham ('99), and was first presented as a searchable database of Persian and Islamic miniatures, including history, bibliographic, auction brochures, maps, and other notes. It was submitted as her thesis for the Bachelor of Arts with Honors for an Independent Concentration. Kneeling bearded man holds open a small book. Muted color palette. Bearded man kneels on a carpet in an opulent interior. Unfinished drawing of an elephant carrying a rider and an empty carriage seat. Standing man wearing an elaborate costume holds a shield and sword. Landscape background. Peasant man stand with a grazing bull in a landscape setting. Seated woman works on embroidery or painting on a fabric sheet. Fragmentary portrait of a standing man and flowers. Substantial areas of excision. Central portrait panel of a woman surrounded by architectural setting and a floral painted border. Standing woman wearing a sheer gown is seen in profile against a dark landscape. One man kneels on a prayer rug under a tree by a river. Figure wears a red cap and white robe. Unfinished sketch. Two kneeling men and attendant greet an enthroned nobleman. Standing man seen in profile holds a falcon in his right hand. Figure is against a green background. 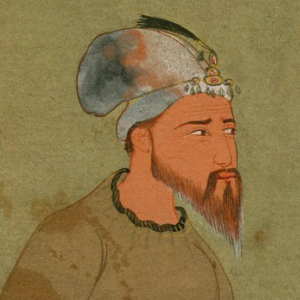 Mughal-style portrait of a white-bearded man on horseback holding a small human figure. Standing man with a white beard is seen in profile with gold halo. Wears a white robe, holds a sword. Standing woman seen in profile against a greenbackground, with flowers. A royal man shoots a gazelle with long-muzzle gun, with help from an assistant. Night scene. Standing man with a white beard holds an arrow. Subject wears a white headdress, robe, green boots. Standing man in profile with various weapons wears a floral embroidered robe. Drawing of a seated male figure holding a flower. Single kneeling bearded man kneels while holding a book. A drinking vessel sits before him.